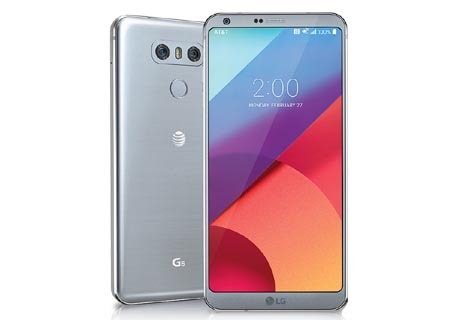 Last Year LG tried innovative Modular design concept in their Flagship phone LG G5 but people didn't like it as expected by the company so now with Latest LG G6 they are back with the traditional design and many improvements over the feature. The key specs you will find in the phone are 5.7 inches Display, Android v7.0 (Nougat) OS, Snapdragon 821 Processor, 13 MP Primary | 5 MP secondary camera, 32/64 GB ROM, 2 TB SD Card support, 4 GB RAM and 3300 mAh battery. Phone built on a metallic frame and rear of the phone is covered with the Corning Gorilla Glass 5 and the display is protected with Corning Gorilla Glass 3, We didn't understand why such a premium phone is using older Gorilla glass version. Although The design of the phone looks premium and also it is quite comfortable to hold with only 7.9mm of width. The volume keys can be found on the left of the device, 3.5mm headphone jack is placed on top of the device, bottom houses USB Type-C port and a single speaker, right edge features the SIM card slot and back flanking the rear-mounted power button. LG tweaked the display for supporting new 18:9 (2:1) aspect ratio screen, having 1440 x 2880 pixels resolutions and 564ppi of display density. We were expecting the AMOLED touchscreen but for now, they are offering IPS LCD display, Although that is also vibrant and pleasure to eyes. The brightness of phone is quite impressive that it can go up to 663 nits in direct sunlight means you can also enjoy your visual content in daylight without any trouble. Using 18:9 aspect ratio for splitting the display for running 2 apps simultaneously is fun. The phone screen is not easily scratchable as it has Gorilla Glass protection. People will see it as down gradation of camera from the 16 MP to 13 MP from last year, but photos taken from LG G6 can easily suppress the LG G5 when it comes to quality of pictures. The new LG G6 has a wide-angle lens which can really take some breathtaking shots without losing quality. The camera interface is also quite easy to use however there are also many pro modes to use from. 5 MP camera for taking selfie can take wide angle photographs also in good quality if sufficient lighting is provided. The company decided to launch this handset with Snapdragon 821 (a processor from 2016), This is because for Snapdragon 835 they can't deny the launch date of this phone for a couple of months. However, phone is capable of digesting everything whatever you through on it from multitasking to heavy gaming. You can run all the tasks without any glitches. The credit for smooth performance goes to the combination of Snapdragon 821, LG UX 6.0 UI based on Android v7.0 Nougat and 4 GB RAM. There is 3300 mAh battery inside the phone for providing a well-balanced backup. Even after having such a large display phone able to manage the 5.5 hours SOT (Screen on Time) and even for a typical heavy user it can stand for one full day. There is also a support of Qualcomm Quick Charge 3.0 which can fully charge the phone in about 1:40 hours. Support both HDR 10 and Dolby Vision. The display is vivid and vibrant. The phone supports OTG Cable. Very narrow bezels on the sides. Memory can be extended up to 2 TB with the help of external SD Card. Dual SIM version is also available. IP68 certified dust/water proof over 1.5 meter and 30 minutes. Snapdragon 835 is not provided for such an expesive phone. Dual SIM support is Hybrid. Speaker Loudness is not strong. For many regions only 32 GB ROM version is available. This handset design is smartly managed with 18:9 aspect ratio and narrow bezel, phone has more usable display without feel of bulk size. The premium and compact design is kind of attention seeker. On the performance, Snapdragon 821 with 4 GB RAM works perfectly and for capturing your favorite moments 13 MP primary camera with wide angle lens performs well. There is no perfect device so this device also has its own downside but for a typical powerful user this phone suits well, however, the same CPU is also found in low priced OnePlus 3T.